One of the means to success is to have perseverance in doing something despite the difficulty or time it takes to achieve success. I have practiced this in my career and in my life. It is the impetus behind my creating the sculpture seen above. I hope you enjoy this video made by the talented Jesse Bass. It discusses emotional strength, my internal coping abilities and fortitude I needed to deal with the challenges I faced in my life. I hope it can be an inspiration for all those talented artists and people who follow me. The Midpoint, Giardini Marineresa, Venice, Italy, Hand-Patinated Resin, 2017, 53" x 22" x 16"
I named this sculpture ‘The Midpoint"‘. It depicts a young girl who has just become a young woman. OOH, to be eighteen again! This video shows, not only my sculpture ‘ Kendall Island’ seen above, but ten of my outdoor sculptures gracing Marinaressa Garden in Venice Italy. Contemplation, Resin, 2018, 33" x 32" x36"
When the young woman seen in my sculpture ‘Contemplation’ posed for me, she was deep in reflection, pondering the avenues of her life and where she wanted to be in the future. I believe that we should all take a little time to meditate each day and contemplate not only our day, but our direction. Enjoy this beautiful video about a day in my life. Chrysalis, c24 Gallery, New York City, 2017, Resin, 33" x 18" x 36"
‘Chrysalis’ is the form a caterpillar takes before it emerges from its canon fully formed into a beautiful butterfly. Leda and the Swan, Palazzo Mora, Venice, Italy, 2015, Oil on Resin, 42 x 80 x 90 "
In my sculpture Leda and the Swan, we see a figure embellished with gold and crystals lounging on a painted swan. Upon further contemplation, the piece really embraces the eroticism associated with much of Greek mythology, while telling the story of deceit and treachery. Leda, is portrayed in a 1020’s bathing suit, but was really influenced by a Greek fable going back in time. In the story, the God Zeus, who was disguised as a swan, seduces Leda who then bore Helen of Troy. I remember when the sculpture was in Venice at Palazzo Mora and it needed its own bodyguard because so many people wanted to touch it. Bibi on the Ball, Giardini Marineresa, Venice, Italy, 2017, Oil on Resin, 64" x 46" x 34"
A beach ball is a large ball filled with ait that people play with, especially when they go to the beach. Above we see ‘Bibi’ having a perfect day, something we all want on our day of leisure. Bibi on the Ball was inspired by my love of the beach and the enjoyment of the simple things in life. Remember, always live in the moment. Please join me on ISDay, International Sculpture Day, in my studio at Mana Contemporary. Christina, New York City, 2014, Patinated Bronze. 72" x 19" x 14"
Christina is a girl who dreams of being a traveler. In her dreamlike state above, she wonders whee her next adventure will take her. In this video you can watch me put water drops on my sculpture ‘ Balance’ and spend a day with me in my studio. 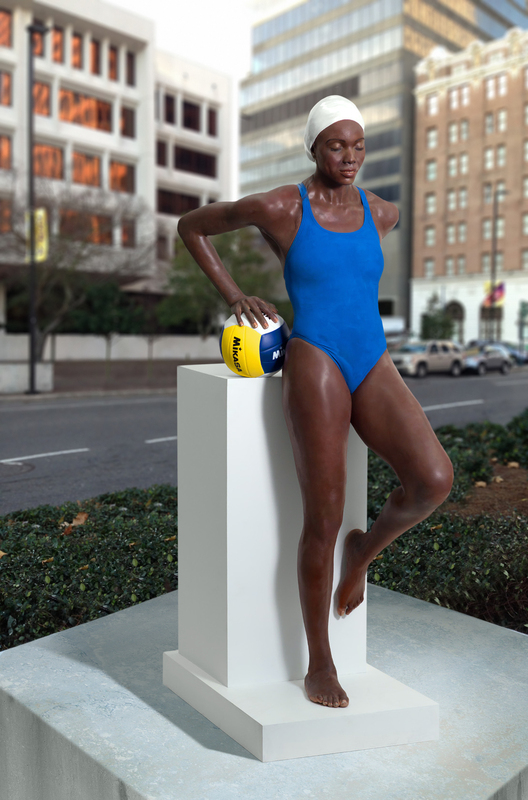 Yaima and the Ball, New Orleans, LA, 2014, Oil on Resin, 70" x 28" x 39"
Inner tube Varient II, Resin & Swarovski Crystals, 2017, New York Studio, 17" x 32" x 15"
This is how to spend the perfect day, on a tube with a crystal crown on our head. Enjoy this video, chosen by Facebook’s Insider Art with over 5 Million Viewers. Kendall Island, Giardini Marineressa, Venice, IT, Lacquer on Resin, 2015 - 2017, 70" x 21" x 39"
Capri, 2013, Aria Gallery, Florence, Italy, Oil on Resin, 30" x 20" x 11"
This sculpture was inspired by the island of Capri in italy. It is one of my favorite places. ‘The General’s Daughter’ made her first public debut in the Smithsonian Museum’s Portrait Gallery. Now its in a show called Hyperrealistic Sculpture and has traveled to eight countries so far. The Goddess, 2016, Oil on Resin, 51" x 21" x 32"
This goddess listens to the sound of the ocean by putting a shell to her ear. Now she is in Mykonos at Rarity Gallery and still listening to the sea. Tree, Jim Kempner Fine Art, New York, 2013, Oil on Resin, 62" x 37" x 29"
Girl with the Red Hat, Resin, 2018, 24" x 24" x 65"